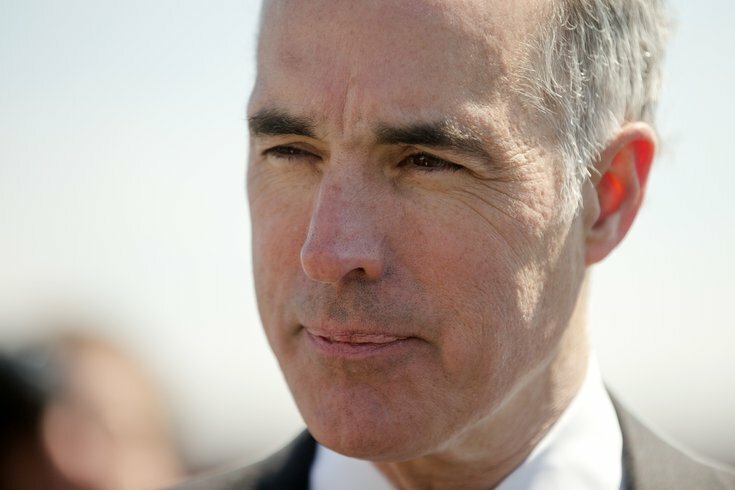 U.S. Sen. Bob Casey, D-Pa., meets with people after a news conference calling for federal officials to provide funding for a Delaware River dredging project, Friday, April 24, 2015, in Philadelphia. U.S. Sen. Bob Casey, D-Pa., announced Thursday that he will oppose the nomination of Judge Neil Gorsuch for the U.S. Supreme Court. Casey released a lengthy statement detailing his decision, which he said came after meeting with Gorsuch, thoroughly reviewing his judicial record and listening to hours of his testimony before the Senate. Casey said it is his duty to evaluate a nominee based on character, temperament, professional and personal experience, judicial philosophy and prior judicial rulings. He said he has "serious concerns" with Gorsuch's "rigid and restrictive judicial philosophy." "It is a judicial philosophy that employs the narrowest possible reading of federal law and exercises extreme skepticism, even hostility, toward executive branch agencies," Casey said. "Judge Gorsuch opinions often reflect a commitment to satisfy his judicial philosophy more than to grapple with the complex circumstances faced by ordinary Americans. Disproportionately, powerful interests are the beneficiaries while workers, consumers and those with disabilities are the losers of this approach." Casey said he feared Gorsuch's confirmation would make the Supreme Court a greater ally to large corporations, which would "stack the deck against ordinary workers and families." He pointed out one case, TransAm Trucking v. Administrative Review Board, in which Gorsuch was the only judge who sided with a trucking company that fired an employee for abandoning his trailer in life-threatening conditions. Casey said he considered Gorsuch's nomination without pre-judgment but concluded his approach will not ensure fairness for Pennsylvania workers and families. "We cannot demand perfection from Supreme Court justices," Casey said. "But we can demand a constant commitment to fairness, to protecting all Americans regardless of power or wealth, to that guiding creed: equal justice under law. I have concluded that Judge Gorsuch is not the right choice to fulfill this commitment." Read Casey's entire statement here.